Today the world Cup FIFA exhibited at St. Michael’s waterfront — Novosibirsk became the second city in the itinerary of the Cup of Russia, immediately after. “On 5 and 6 may official Cup will be at St. Michael’s waterfront, where everyone will be able to see the legendary trophy with their own eyes and to make him a commemorative photo”, — told the correspondent of the NHS regional Director of directions of internal and external communications of Coca-Cola HBC Marina mokina. The ceremonial welcome Cup was attended by the mayor of Novosibirsk Anatoly Lokot, acting Governor of the Novosibirsk region Andrey Travnikov. Already on 8 may, the Cup will take Yekaterinburg. The end point of the tour will be Moscow, world Cup FIFA brought to the capital on 3 June. 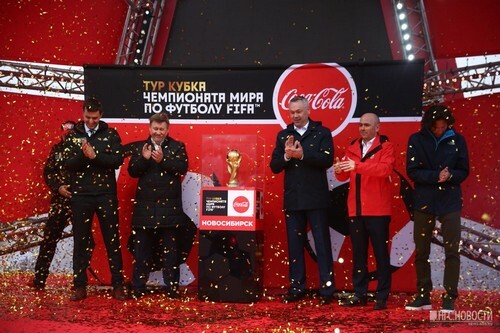 The organizer of the travel of the Cup was made by the Coca-Cola company. In 2015 in Novosibirsk brought the main trophy of the championship Continental hockey League — the Gagarin Cup, you can see it in the shopping center “MEGA”.